Man oh man has it been a whirlwind few months! I am a homebody to my core, and after three months I am tired. But more importantly, very very excited about the coming year, all of the new people I’ve met, opportunities and relationships that have cropped up in this time, and all of the awesome places I’ve been able to explore! Of course conference hopping wasn’t the only thing that happened in these three months, but since it has all been so informative and fulfilling I wanted to share my overview and highlights of this season, not just for my own record keeping but also as an informative snapshot for any other young preservation entrepreneurs who might be interested in some of these conference experiences. My travel buddy to all of these conferences was Sarah Marsom, and if you are interested in how we managed to afford all of this, go check out her blog on cutting down conference costs here. Long story short, a member of the conference planning committee for APT was actually the architect to hire me for the St. Sebastian project I completed in Akron this past spring. He accepted a new job and invited me to visit him in his new position as the Architect of the National Gallery in D.C. before the conference. I’m a big fan of road trips, and my travel buddy was down, so we decided to “combine” (read: extend our trip by a week and 700+ miles) in order to see him. So, not specifically related to conferencing, but definitely related to networking, we spent a significant amount of time meeting with preservation peeps in D.C., including a number of National Trust folks, conservators in the National Gallery and National Portrait Gallery Museums, and Carlos Carmonamedina, one of Sarah’s fellow 40 under 40 award winners. D.C. is obviously full of historic treasures, and we had a fantastic time touring around town seeing all the things. Specifically, if you are interested in art conservation, check out the Lunder Conservation Center in the National Portrait Gallery. Their lab is in a fish bowl so you can watch the conservators at work, and they may even come out and answer your questions! The most energy efficient building is one that is mothballed. Energy use is truly determined by our modern expectations of comfort . We need to start thinking about how buildings were meant to function when they were built, and how we expect the public to interact with its new use before we begin making alterations or setting expectations of efficiency. Early American glass used to be mixed with manganese up until WWI in order to clarify the color of the glass. It turns out, when exposed to ultraviolet light, this manganese stains the glass a violet purple color. So if you’ve ever seen purple cut glass door knobs, now you know those weren’t actually made that way, but have actually discolored over time being exposed to the sun. AND THEN!!!!! We kept going! 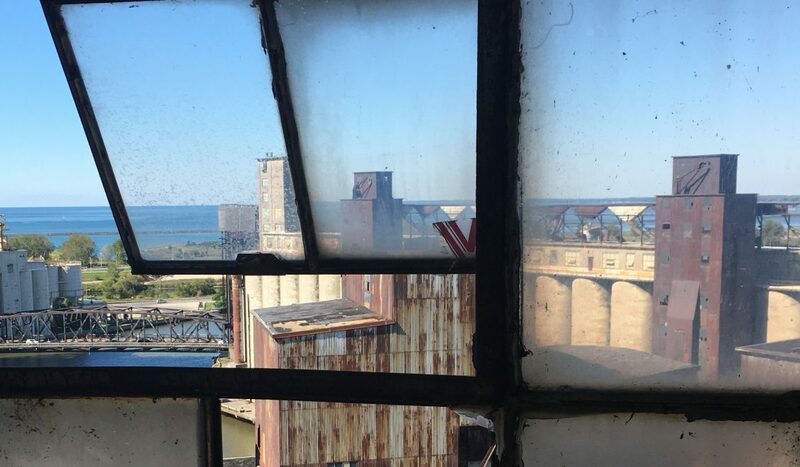 If you haven’t heard of The Rust Belt Coalition of Young Preservationists you seriously need to go check them out. We attended a Rust Belt takeover the following weekend in Indianapolis with 100 of our closest preservation pals. Seriously one of the nerdiest, best things I do all year. Highly recommended. This one is going to be a given each year as long as I live and work in Ohio. Going to your local statewide preservation conference is pretty common sense, but being invited to speak about my project at St. Sebastian was a nice cherry on top! I partnered with Elizabeth Murphy, a principle of Perspectus Architecture in Cleveland, OH to speak about the St. Sebastian mosaics and overall church restoration project. The conference largely focused on educating our state’s Main Street managers, but also gave us the opportunity to meet folks from all across the state and hear what they were working on in their communities. The exhibition area was not great, but still the conference provided lots of great local networking and definitely was the most accessible of the conferences on this list in terms of geography. Another opportunity that arose thanks to this conference was that we were able to attend one of the first group meetings of the Sixth City Young Preservationists, the Cleveland branch of our Young Ohio Preservationists group. If you’re in that area, they have lots of exciting things in store, including our annual trip to the Kurentovanje Festival in February! What National Trust provides: Sessions on the big idea issues in preservation. This year’s keynote speakers focused on global warming. The smaller sessions I attended focused a lot on minority representation issues, easements, marketing, and how to get press coverage for small organizations. Big insightful and inspiring ideas, with a few smaller takeaways for my own work. Why you go: NETWORKING! And because it was in San Francisco, duh, but mostly networking. For me, having worked in SF in the past, this was doubly true. I was able to meet with lots of National Trust folks, and get in front of people I want to get to know better for potential future projects. I also was able to meet with old coworkers and brainstorm about more detailed issues and problem solving related to my day to day work, and catch up on what they had been doing and learning recently. As for 2019, my conference lineup right now my plan is for AIA Ohio Valley and Heritage Ohio again. If you have any recommendations for me for next year or questions about my 2018 season, feel free to contact me at Lindsay@blindeyerestoration.com! Lindsay has a background that makes her a great asset for many different types of preservation and restoration projects: academic, professional, and hands-on experiences that translates into a great working relationship and well-executed projects, from preliminary planning to implementation of specialized treatments. Lindsay has the preservationist's passion and contractor knowledge to help bring old historic structures back to a useful purpose. Every time I recommend Blind Eye Restoration I express the breadth of understanding Lindsay brings to her preservation/conservation work. Lindsay understands building materials and best methods to ensure the work she performs is a long term repair. Blind Eye is flexible, efficient, and caring with regard to the objects conserved. Practical, hands-on conservation methods with good attention to detail.